Use the Administrative module to control how data is captured, improve standarisation and maintain better security. Block a user from deleting an item. Block a user from adding an item. Control whether the Generic Thesaurus or ThesaurusMD is used. The Generic Thesaurus is a scaled down version of the ThesaurusMD that is included with the HumanitiesCMD. 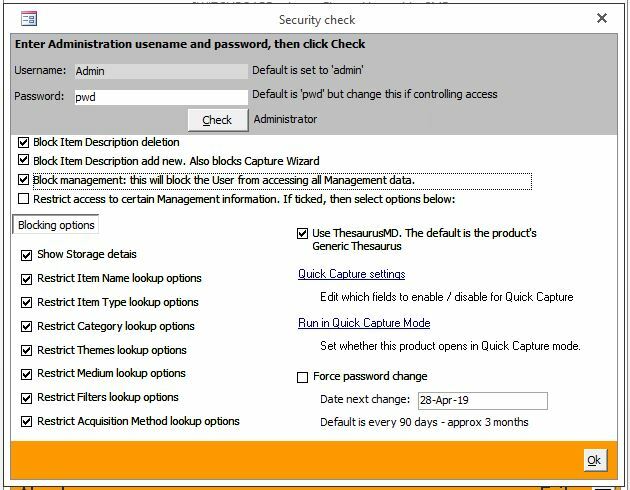 If your organisation is using multiple databases and needs to maintain one set of keywords then the ThesaurusMD is required. This can be managed by a limited number of people who control the keywords used. The user will only be able to use the keywords available and not be able to add new ones. Block access to all Management data. Restrict access to certain Management data. 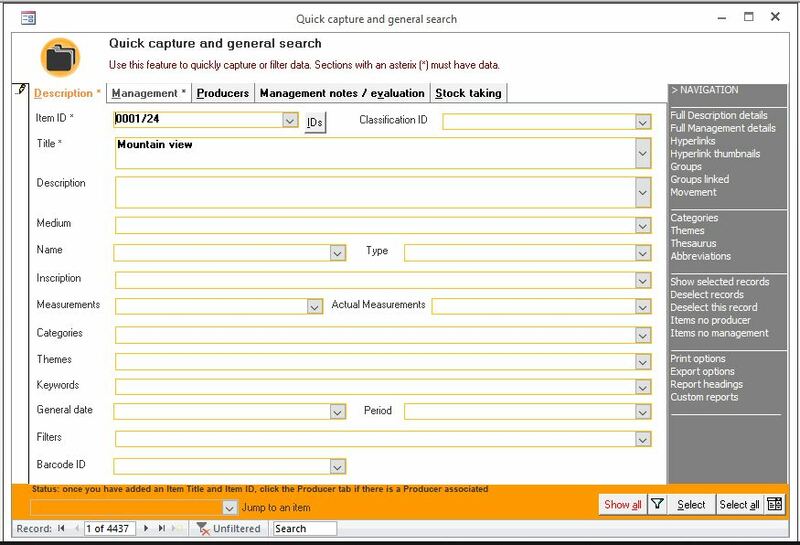 Functionality to assist standardising data which has to be captured before item is accessioned. This can be controlled via the upgrade Quick Capture feature. 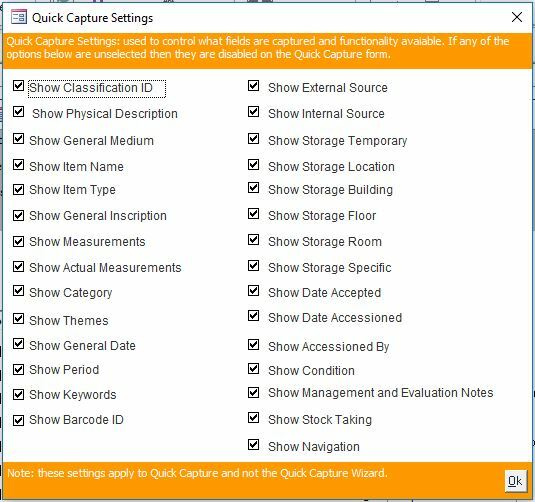 Standardised lookups / dropdowns for storage locations, item names and types, categories and themes. This applies throughout the HumanitiesCMD. Make use of a mandatory password change - default is 3 months. Standardised dates inputs HumanitiesCMD - this applies to text and date formats. Actual date formats use the built in calendar. Standardised field names between ResourceMD and HumanitiesCMD to improve the useability of both products and assist in standardisation. Standardise the lengths for main fields such as Item IDs, Classification IDs, etc. Again to assist in standardising your organisation's data. to export data and record the producer with each item - for example: if three producers have collaborated to create one item, the item details will be repeated with each producer associated. to export items and producer details with no duplication of items as the producers are grouped with the item. Type which can be a 'high estimate', 'low estimate', etc. Currency - any currency can be recorded. Exchange rate at the time of the evaluation. Foreign evaluation which converts into the local currency. Description now includes a new field called Quantity which is very useful to record the number of items associated with an Item record. For example: you may have captured a tea set that consists of 12 items. Ideally you capture all 12 items but now you can capture the whole set in one record and place '12' in Quantity. This is also used for a true total of the number of items in your collection. For example: you might have 1000 Item records but true number of actual items might be 1030. Description includes a Current field. This is to quickly tag items that might be archived, i.e. it might be de-accessioned.